Here you can read what our previous customers have to say about us ! Even so, you can be assured of first class service from a company that has been supplying the party market for over 15 years. Rosettes arrived – speedy delivery, absolutely perfect! Would like to say a massive thank you for all your help with the order and for having such a quick turnaround time. The rosettes were fantastic and brilliant for the day - everyone loved them. 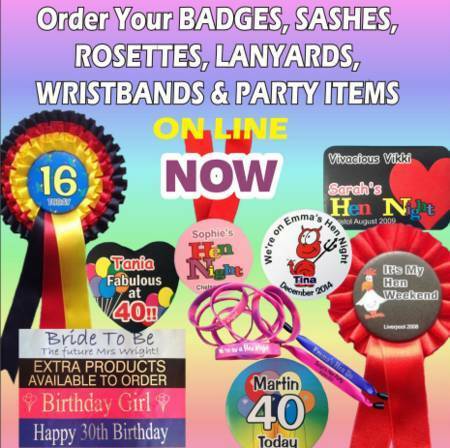 A fantastic service from mypartywear.co.uk. A sample was initially sent to me via email, which was exactly what I wanted. I received the actual badges today (extremely quick delivery) and they are even better in real life! Thank you very much - highly recommended. I ordered some badges for myself and my friends to wear at our friends birthday and what I received was amazing! They look so good! And we can't wait to wear them out and show them off! I didn't expect such a quick response to my enquiry, I was shocked and got a mock the day after. And I got guaranteed next day delivery! So happy! I ordered sashes on Tuesday 3rd January 5 pink and 1 blue around dinner time and by 5:15 I had an e-mail to say they were dispatched and they landed on my door step on Wednesday morning. I would just like to say how impressed I was by your fast service and how gorgeous the sashes were for the price you charge, I looked around for sashes before ordering from yourselves and being the cheaper option i honestly didn't expect much but with being on a budget I had to go for what I could afford but I have to say I am so impressed and will be recommending you to anyone that asks regarding party wear. Just want to thank you again. Ordered some photo birthday badges and couldn't be happier with them. Turnaround time was really quick, all queries were answered straight away by friendly employees. Looking forward to ordering from My Party Wear again in the future! Just wanted to say I received my order today I can't believe how quick it came! The sashes are amazing, I couldn't be any happier with them! Thank you so much! 100% recommend! Ordered yesterday morning and they arrived this morning. Super quick delivery, easy to order, good communication via email too. This is my second time ordering for a special occasion and I will definitely use them in the future. Can't say enough good things! Thankyou so much for the lovely personalised rosettes I ordered. Super quality, excellent customer service and arrived within 48 hours of ordering. I used one as the centrepiece for a birthday cake for my pony mad niece - she was delighted! Really quick service on a very last minute order, very friendly and reasonably priced - would recommend to anyone!